Susanna lives on a farm in the Twelve (the future St Catharines) in Upper Canada with her parents and her older brother and sister. She is entirely satisfied with her life there except when the adults talk of a coming war between England (and therefore Upper Canada) and the U.S. When the war finally starts, Susanna's father and brother have to enlist and the women are left alone to take care of the farm. 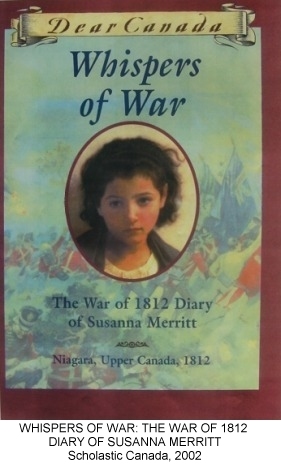 Although she finds the war frightening and confusing, Susanna has an exciting time during the Battle of Queenston Heights, when she has a poignant encounter with the famous General Brock. This novel, part of the "Dear Canada" series, is in the form of an imaginary diary. When I was asked to write a book for the "Dear Canada" series I was given a list of possible topics. The War of 1812 immediately appealed to me, since I had often heard a family story about my great-great-great grandmother, Susan Merritt. The story was that Susan Merritt buckled on General Brock's sword the night before the Battle of Queenston Heights, to bring him luck. Whether or not this story is true - I could find no evidence of it - it inspired me to write a novel based on the encounter. And it was a good excuse to research my Merritt relatives, United Empire Loyalists who settled in St Catharines, Ontario. I was lucky to discover the journal of William Hamilton Merritt, Susan's older brother, which gave me much material for the novel and a feeling for the times. If I had tried to write a diary that would be absolutely true to the style of the period it would have made stodgy reading, with most words capitalized and very formal language. My biggest challenge, therefore, was to choose a style of writing for Susanna that was accessible but still true to the times. Finally I re-read some Jane Austen novels, which were written about the same period, and realized that she never used contractions! So Susanna doesn't either, which I hope adds an old-fashioned quality to the text.